At last week’s Regular Council Meeting held on Monday, April 8, 2019, council ultimately approved four locations for zoning that would allow cannabis retail sales in Sooke, in a near-unanimous vote with only Councillor Ebony Logins opposed. 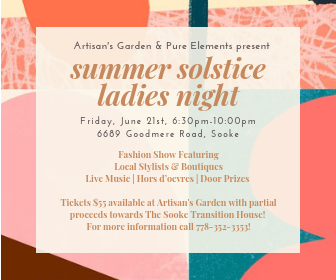 The locations are at 6309 Sooke Rd (Riverside Cannabis, near the Castle), 6601 Sooke Rd (formerly known as Medijuana), 6686 Sooke Rd (642 Cannabis) and newcomer 5449 Sooke Rd (Stickle Back / Westcoast Adventure College). Note that Council was only approving the zones to allow cannabis retail sales. Individual store owners still need final approval from the province to operate. Municipal zoning is in no way connected to provincial business approvals for marijuana retail sales. The seven citizens who spoke at the public hearing portion of the meeting raised several concerns. For the most part, most who spoke were concerned about the road access and safety to the 5449 Sooke Rd, located on a curve at the base of a hill. One felt that this was a new industry with a limited clientele and daily limits on per-person purchases, and feared that watering it down to four locations could be a detriment to all. There was no value in rushing this fourth approval. Additional competition will be added when Langford opens their storefronts, which will in turn mean business disappearing from Sooke. Cannabis tourism was recognized as a growing industry. One speaker said that they would prefer to see Sooke not engage in cannabis retail, period. Counc. Brenda Parkinson said she was perfectly fine with four stores opening up now that it’s legal. It’s not their job to set limits on competition. Counc. Al Beddows shared the safety concerns of the 5449 Sooke Rd. location, but not enough to eliminate his support. Counc. Tony St-Pierre noted that 95% of wildfires were caused by smokers. As far as a gateway, he noted that Sooke has a growing reputation for some of the best alcohol and some of the best bud. As far as traffic concerns, he noted that as long as there is a business that that location — whatever it sells — there will be traffic issues. Counc. Jeff Bateman noted that of the four proposed shops, two would be independents and two would be attached to larger operations with partnerships (the Medijuana shop is owned by a business called Shoom, which is aiming to franchise across Canada, and the College would also be bigger in scope). Counc. Ebony Logins noted her own roller coaster ride with this new industry. She does still have concerns about the fourth location. Logins felt they shouldn’t rush it. Parkinson moved that council give third reading the motion, as it. Beddows seconded it. Present: Mayor Maja Tait and Councillors Jeff Bateman, Al Beddows, Ebony Logins, Megan McMath, Brenda Parkinson, and Tony St-Pierre.